The AWS Cloud impacts all corners of your campus and beyond. The cloud sparks education innovation by helping to reduce costs, improve service delivery, and increasing student access to their education. 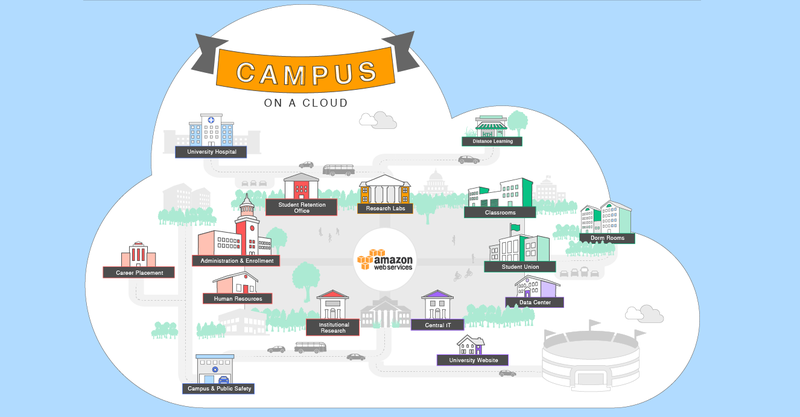 Explore the Campus on a Cloud map to learn how and where universities use the cloud every day. Reduce campus facilities costs and free your staff from undifferentiated technical work by migrating data centers to the cloud. Learn how Harvard Business Publishing ended their data center contracts and moved operations to the AWS cloud. Increase efficiency and lower costs while offering more services to academic departments and research teams by utilizing cloud services. Compute, storage, database, and networking options help transform IT departments, allowing them to focus on teaching and learning. See how the University of Notre Dame went “all-in” on AWS and saved over $1M on infrastructure costs. The website is the institution’s a key tool for student recruitment, alumni relations, and athletic events. See how Villanova University seamlessly and cost effectively scaled their website capacity for the 2016 NCAA Men’s Basketball Championship. AWS helps university researchers process complex workloads by providing the cost-effective, scalable and secure compute, storage, and database capabilities needed to accelerate time-to-science. Learn how the UC Santa Cruz Genomics Institute uses AWS to analyze large genomics data sets to help improve patient outcomes. Student retention is top-of-mind for colleges and universities with learner analytics initiatives becoming crucial to their strategic plans. See how Ivy Tech Community College built its own retention solution on AWS and can now predict student success with 81% accuracy within two weeks of the start of a term. Give your students a practical, hands-on IT education using AWS Educate. This free program for provides AWS credits, training, and support resources that help educators integrate cloud into their curriculum. Find out how one UPenn professor transformed a lecture-based program into a dynamic learning lab using AWS Educate. Colleges and universities capture data on everything from enrollment to athletics, creating warehouses of valuable information that can be mined for informed campus decision making. Find out how HelioCampus, founded at the University System of Maryland, used AWS to build a new analytics platform that helps institutions dive into data and create real-time insights. Providing a safe campus environment helps students focus and thrive in their academic careers. See how LiveSafe used AWS to develop a mobile safety app that empowers students to share information, report dangerous situations, and communicate in real-time with safety officers. The AWS Educate Job Board aggregates cloud careers and matches employers with students that have earned badges in the required skill areas. Learn how one instructor at the British Columbia Institute of Technology worked with industry to give students a two-year practical cloud education, preparing them for immediate employment. It’s more important than ever to provide students with resources where they are. Wayne State University solved this challenge by building their own Enterprise Social Portal called Academica on AWS. By uniting their various educational technology solutions under one portal that includes SSO, students have access to everything from their LMS to payment systems with just one log on. The promise of personalized medicine is already here and for many university hospitals and medical centers, the cloud helps them provide the latest advances in medical care while still complying with HIPAA regulations. Learn how Boston Children’s Hospital uses Amazon Alexa to give parents the tools to diagnose illnesses at home. ERP systems are the heartbeat of an institution. These solutions help campus administrators automate admissions, allow students enroll and register, and manage a student’s college career. Find out how Ellucian is moving their on-premise solutions to a new SaaS solution, powered by AWS. Learning takes place on and off campus, at all hours of the day. AWS helps institutions give students access to key learning resources. Find out how the University of Maryland uses Amazon WorkSpaces to enhance student access to software anytime, anywhere.